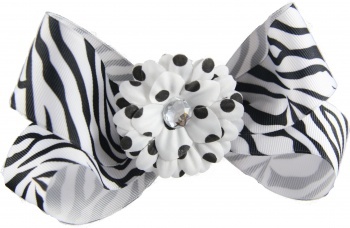 Black and White Zebra print bow with a Black and White Daisy on top. You can not ask for any better combination of black and white. This is a 2 for 1 bow because the daisy is on it's own alligator clip and can be worn by itself or kept attached as shown. The base bow also can be worn by itself, it is on a French clip. It is 1.5" wide grosgrain ribbon.